Oil and gas producers have done poorly in the past year. 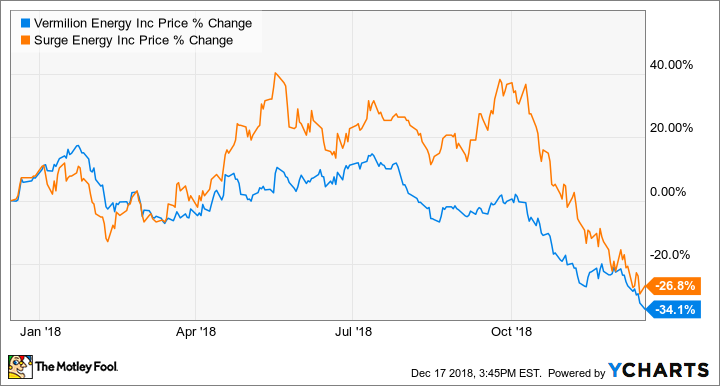 Here we’ll focus on two top companies for an energy resurgence in 2019: Vermilion Energy (TSX:VET)(NYSE:VET) and Surge Energy (TSX:SGY). VET data by YCharts. The price action of TSX:VET and TSX:SGY in the past 12 months. Dividends shouldn’t be the main focus when investing in oil and gas producers. However, admittedly, it’s easier to hold on to volatile stocks when you’re getting a nice income — it feels good to get some returns back periodically from the dividends. Currently, Vermilion Energy and Surge Energy offer whopping yields of 9.86% and 7.09%, respectively, as of writing. Investors should note that dividends from oil and gas producers cannot be fully trusted because the profitability and cash flow generation of the businesses are more or less dependent on oil and gas prices. When oil and gas prices are low, the businesses make less money or may even operate at a loss at times. Vermilion Energy has always been prudent about its payout ratio. That’s why it has maintained or increased its dividend per share every year since 2003 — through the last recession and through the oil price collapse from 2014 to 2016. In the first nine months of the year, Vermilion Energy declared dividends that were 46% of fund flows from operations with a total payout ratio of 98% after accounting for exploration and development capital. In a base-case scenario, management expects the total payout ratio to improve to about 82% in 2019. Surge Energy pays out about 17% of cash flow as its dividend, which gives it the flexibility to use the remaining cash flow for other obligations. Instead of the dividend yield, investors should focus on picking up the stocks at a low price. Notably, the fair-value estimates of oil and gas producers can fluctuate wildly due to the large swings of the prices of the underlying commodities. The adage of “buying low and selling high” has never been truer when it pertains to oil and gas producers. Currently, the analysts from Thomson Reuters have 12-month mean targets of $50.90 per share for Vermilion Energy and $3.30 per share for Surge Energy, which represents near-term upside potential of nearly 82% and 134%, respectively, from their stock prices of $28 and $1.41 per share as of writing. Oil and gas producers will lower production, which will reduce the reserve levels of the commodities, as demand remains stable. In 2019, we should see improved oil prices and hopefully improved gas prices as well. With Vermilion Energy trading at below five times cash flow and Surge Energy trading at about 2.5 times cash flow, they’re dirt cheap, but they’re surely not dirt! Patient investors with a high risk tolerance should do well by picking up some shares for a much brighter 2019. Now, let’s move on to the next Foolish idea!